The History of Playgrounds – Past, Present and Future. Playgrounds are places designed for children to enjoy themselves in a carefree environment. A modern day playground is brimming with a wide range play equipment such as swings, slides, trim trails, play towers, sand boxes, jungle bars, playground markings and much more. Playgrounds help with the development of physical strength, fitness, co-ordination and flexibility; whilst providing a great place for interaction and enjoyment. London first witnessed the introduction of ’junk playgrounds’ in the period following World War II, via the landscape architect and children’s rights campaigner Lady Allen of Hurtwood. She changed the name to ‘Adventure Playground’ in 1953; creating the National Playing Fields Association (now Fields in Trust), which saw the coordination of adventure playground projects throughout the country. 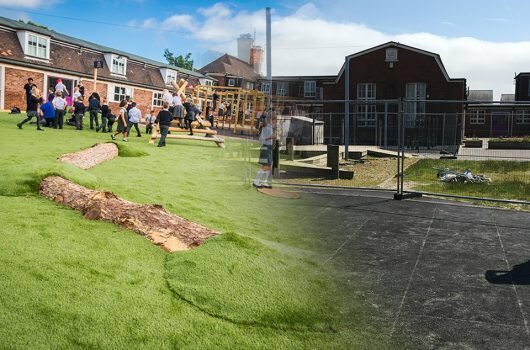 These playgrounds were constructed from recycled ‘junk’ which the NPFA provided in order for children to design and create playgrounds in spaces such as bomb sites, building sites and wasteland. Since then, playgrounds have seen many design trends and playground design can now be seen as a form of artistic architecture. A good design is considered: challenging but safe, aesthetically pleasing, cost effective and innovative. Materials that have been used and continue to be used include: wood, HDPE plastic, steel, aluminium, rope, rubber, artificial grass and many more. Most modern playground incorporate all these materials. Wood is currently very trendy due to its natural and decorative properties. 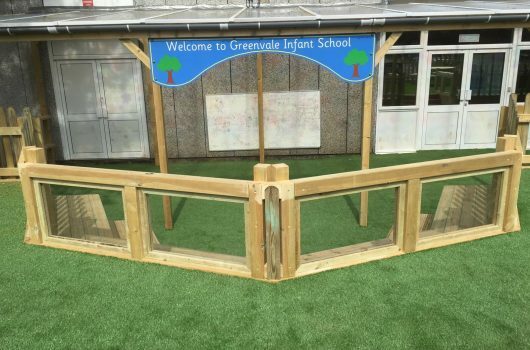 It is common to see climbing frames, trim trails and swing posts using wood as a main material. Gaps must measure less than 3.5 inch or more than 9 inch. Equipment more than 30inches high must be at least 9 foot appart. These laws have helped prevent danger in playgrounds but designers are met with the challenge of making playgrounds equally fun whilst still being safe and legal. Good playground design requires concentration on both points in equal measures. School playgrounds incorporate playground equipment, playground markings and curriculum based items to provide children with an exciting learning zone. ESP are experts in this area and are constantly researching, innovating and providing schools with products that incorporate the curriculum into the playground. Our multi-skills thermoplastic markings are a perfect example of building fundamental movement skills amongst children; meanwhile our science, maths and performance products use playground equipment to fuse activity and education into the outdoor play area. In recent years there has a considerable increase in interest for the health and fitness of children; consequently schools have focussed more attention to the outdoor areas. This has resulted in more adventurous playgrounds becoming more common and it is not rare to see a school playground featuring far more than just a hopscotch and a netball court. Modern sports are encouraged in equal measures and our ‘Free:D’ Parkour for Schools range has proven very popular throughout the country. Who knows what the future holds for playgrounds. In the UK, the ‘Olympic Legacy’ was supposed to increase sporting activity in schools, but the success rate only provided disappointment. Competitive sports have long been encouraged throughout the sporting curriculum. Maybe now is the time to let the children play and choose there own physical activities. We are strong believers that multi-skills playgrounds encourage skills that can be applied to every sporting activity; competitive or otherwise. Hopefully playgrounds of the future will offer more choice to children and more schools will encourage their children with more than just competitive sports. We offer the best of both worlds, join in with the fun! If you use this information as a source on your website, please link back to this blog. This case study showcases a truly stunning example of what can be achieved with the development of any school playground.